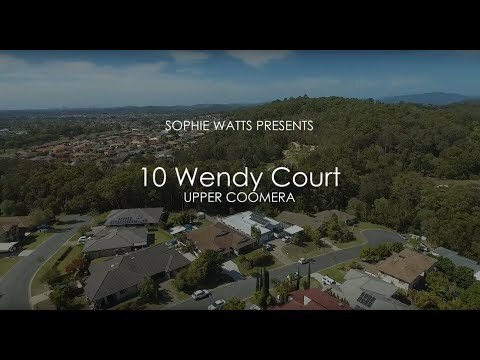 Home is where the heart is and your heart will feel right at home at 10 Wendy Court. This gracious 35 square Plantation home has been built to offer the best in comfort and space. • Four double sized large bedrooms plus a large home office which is currently arranged as a very usable 5th bedroom. All rooms excluding the master suite have been positioned around a spacious and secluded children’s retreat area which can be closed off for dual living or a teenagers’ retreat area. This design is highly sought after and makes for one very desirable floor plan. • The master bedroom is both sizable and inviting with large windows to take in the backyard and let in the natural light. Equipped with a studio style open ensuite with modern decor and a walk through wardrobe offering an abundance of hanging space. • With four living areas in total the remaining three comprise of a separate lounge area for fundamental quiet time along with an open plan dining room interconnecting the kitchen with the outdoor entertaining and a spacious games room or second informal living area. This space hosts huge sliding doors to open the whole home up to the backyard. • The open plan kitchen hosts a large central island bench offering plenty of space to move, a large fridge space, 900mm free standing gas stove, stainless steel appliances and a double door walk-in pantry fit for a large family! • The large main bathroom is ideally placed down the wide hallways and fitted with modern decor and separate toilet ideal for those busy school mornings. • Additional internal features include; *high ceilings throughout *split controlled surround sound in the living/dining and outdoor entertaining * large separate laundry room and additional linen cupboards throughout the home offering plenty of storage options * reverse cycle air conditioning and ceiling fans * tiles throughout * window furnishings * security screens and so much more. • Outdoor appeal is where this property shines with a centrally positioned underroof alfresco area positioned between the main bedroom, dining room and games area. With wrap around sliding doors this area offers the perfect in between space from indoor and outdoor appeal. • Sandstone tiles connect the alfresco with the beautiful gazebo area. The decked area offers a fun place to entertain guests and has been designed to encompass all the peace and tranquillity of the surrounding bushland. Finished with a built in BBQ area and daybed this entertainer’s backyard feels like a holiday away from home. • Tropical established landscaping compliments the usable 888Sqm flat block and with no direct neighbours peering into your yard, you can enjoy the private plunge pool and fire pit area all year round. The block also offers enough room to upgrade the already sizable garden shed or leave everything as is and enjoy peace of mind knowing it’s all been figured out! • Additional external features include; *quaint private deck off the children’s rumpus area * water tank * established gardens * fully concreted perimeter * termite barrier * clothes line area * waterfall feature on the pool * private entrance porch * elevated views over the hinterland surrounds * double lock up garage with additional off street concreted parking area for a boat or caravan. • Ideal location for all the private P-12 Colleges in the area such as Coomera Anglican, Assisi and Saint Stephens. New shopping infrastructure and facilities means everything is right at your doorstep with Jetts gym, Aldi and Coomera Square Shopping Centre with Woolworths, Tavern, medical, chemist and multiple specialty stores, restaurants and takeaway. Walking distance to the new Coomera Hub shopping complex with multiple specialty stores, restaurants and takeaway facilities. Medical, Dental and Chemists. Regular public transport available with easy access to M1 Motorway and 5 minutes from Coomera train station. Theme parks, playground parks, community walkways, boat access to Coomera River near by etc… all within a 5km radius for ease of convenience. Captivated by the exquisite detailing that sets this home heads above the rest, you’ll feel like the world is at your feet with a home that will satisfy and indulge your every need.